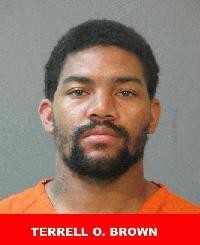 On March 19, Calcasieu Parish Sheriff’s Office deputies were dispatched after receiving a complaint regarding Terrell O’Nell Brown, 24, Lake Charles, physically abusing a 10 year old male family member. Upon arrival, deputies learned Brown struck the victim with a belt and with his hands several times after the child showed him his report card. Brown also sent a text message to another family member stating that he was going to whip the boy all day because of his report card. Deputies observed several bruises on the victim’s buttocks, and when Brown was questioned by detectives he admitted to spanking the child twice with a belt and once with his hand. Brown was arrested and booked into the Calcasieu Correctional Center and charged with 4 counts of cruelty to a juvenile. Judge Michael Canaday set his bond at $150,000. CPSO Detectives Sarah Stubbs and Cinnamon Salvador are the lead investigators on this case.